Seasons greetings from the Rincon Vitova Team! We thought we’d throw in some useful gift ideas your way. From garden upkeep to children’s activities, here are some a few items from The Bug Farm. Deer nibbling your roses? Rabbits munching on your vegetables? Cats burying poo in your garden? Try a motion activated sprinkler! The Scarecrow is a great gift for the gardener with an animal problem. It has an infrared motion sensor and sprays a short blast of water at intruders. It is an attractive alternative to chicken wire or electric fences and work better than chemical deterrents. The passive infrared detector has a range of 105 degrees and adjustable sensitivity to detect animals up to 35 feet away. The Scarecrow can deter small animals such as birds, cats, skunks, and rodents and large animals such as deer, dogs, sheep, and even people. It comes with optional, high contrast “eye” and “beak” decals to scare birds visually. It is water conserving and only uses 2-3 cups of water per spray. Multiple Scarecrows can be connected to the same tap. The Springstar Flea Trap is a super gift for pet owners in your life. It uses a small light bulb whose light, heat, and infrared rays are highly attractive to fleas. 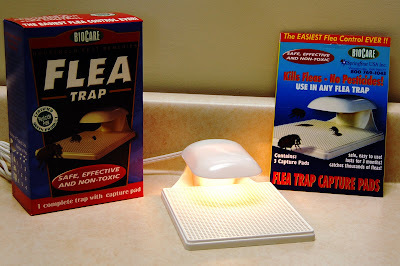 Fleas jump up to the trap, fall through a screen, and get trapped on the sticky pad. Replacement Capture Pads are 5×6, sticky on one side, and come three per package. Get up close and personal with your favorite bugs! The World’s Best Bug Jar is a great way to get to know your beneficial insects and their prey. This jar has a built-in 2x and 4x magnifying glass in the lid and a grid in the bottom to measure your specimen. Great for entomologists-in-training young and old. Four and five year old naturalists find this tool is of especially compelling value in their studies. Make a gift of a basic hand-lens for older insect ecologists. 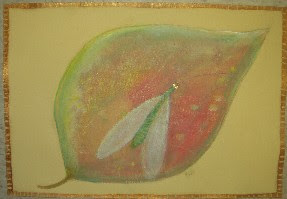 We asked artist friend Alice Williams for an image of a green lacewing adult, also called “Golden-Eyes” and “Aphid Lion”. Her painting in acrylic is reproduced and laminated for unique placemats in subtle hues of red and green on a pale peach background with copper-colored border. The same image is also available as notecards in two sizes. 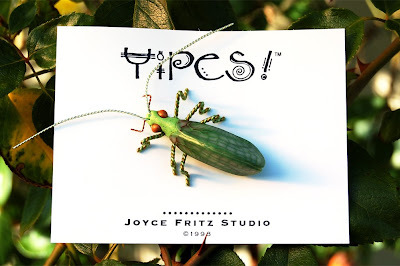 We also commissioned jewelry-maker Joyce Fritz to render a green lacewing adult in polymer clay. There are six pins still available from a limited edition of 12 fashion pins 1 ¾ inch long with 2 inch antennae. Check out the full version of our Holiday Gift Guide here.